1. In a small bowl, dissolve the yeast in water. In a large bowl, mix 3-1/2 cups flour and salt. Using a rubber spatula, stir in the yeast mixture to form a soft, sticky dough, no kneading. Cover with plastic wrap and let rise at room temperature for about an 1 hour. 2. Punch down the dough (with floured hands because it's sticky). Turn onto a lightly floured surface; pat into square. Fold square into thirds, forming a rectangle. Fold rectangle into thirds, forming a smaller square. 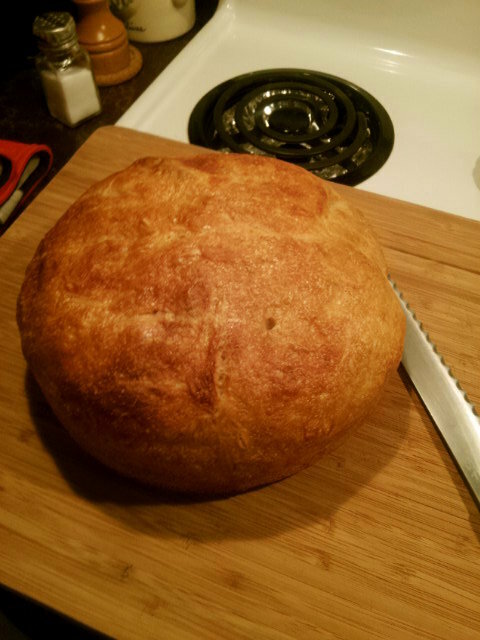 Don't knead or overwork the dough. Turn dough over and place in a greased bowl. Cover with plastic wrap and let rise at room temperature until almost doubled, about another 1 hour. 3. Punch down dough and repeat the folding process. Return dough to bowl, cover and refrigerate overnight. 4. The next day, turn the dough onto a floured surface. Knead gently 6 times only (okay so there is a wee bit of kneading!). Shape it to fit your pan. Place the dough into a buttered pan and cover with a buttered piece of plastic wrap. Let it rise in a warm place (I use the microwave) for an hour and fifteen minutes. 5. Preheat your oven to 500. 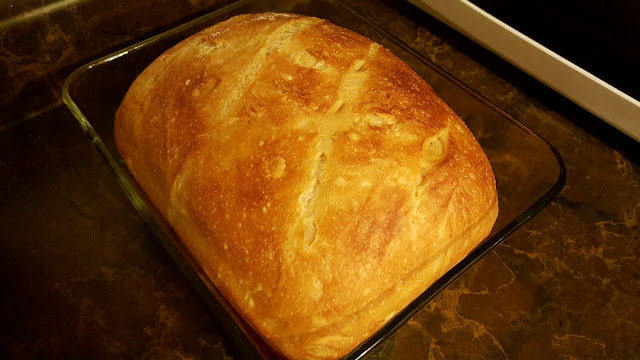 Make a few slashes across the top of loaf. Cover the pan tightly with greased foil. Bake on the lowest oven rack for 25 minutes. 6. Reduce the oven setting to 450. Remove the foil and bake the bread 25-30 minutes longer or until it's a deep golden brown. Let the loaf cool on a wire rack, keeping it in the pan. I keep the loaf uncovered as it cools so that the crust stays nice and crusty, then I wrap it with foil for the first day, and plastic wrap after that. It goes stale quickly though, so it's good to eat it all up within 3 days. If I have leftovers, the birds get a treat! Oh dear you are AMAZING WONDER LADY!!! each job you do is perfectly stunning as this bread looks................oh yummy!